Daniel Fields spent his senior year with Oklahoma’s Checotah FFA Chapter teaching kids in his community how to grow vegetables in gardens they had planted. They then distributed the produce among people in the community who were unable to plant gardens of their own. Through the FFA: Food For All Grants program–now entering its third cycle–other FFA chapters around the nation like Fields’ are able to build similar hunger-fighting initiatives within their communities. 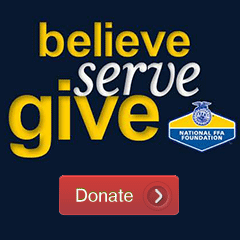 The goal of the booth is to inspire and motivate FFA members by building awareness about hunger within the United States. “We know there are people doing this type of work in their communities, but we not only want to provide 1 million meals to people in need, we also want to hear their stories. We want to share their stories and recognize their contribution,” Ross said. At the completion of the exhibit, FFA members can pledge their commitment to the Hunger Heroes Challenge, a formal initiative to provide 1 million meals nationwide, and track their progress. The chapters are then presented with an opportunity to apply for a $2,500 Food For All Grant to use in a manner similar to Fields’ chapter. A “Meal Math” calculator on FFA.org can be used to help chapters calculate their bounty and there are monthly prizes for donations fulfilled. The Running on Empty expo booth is sponsored in part by the Howard G. Buffett Foundation, Monsanto, Cargill, Nationwide, Land O’Lakes, Elanco, Ram, Farmers Feeding the World and Tractor Supply Company. Becca Harrison is a former member of the Cobleskill-Richmondville FFA Chapter in New York. She is currently a senior at Cornell University, studying animal science and international agriculture. Her studies have taken her from India to the White House, and you can follow her adventures on Twitter @_beccaharrison.